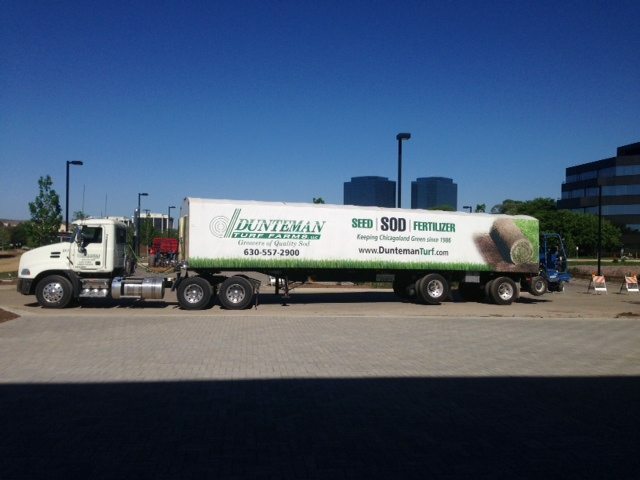 Dunteman Turf Farms delivers lawn products to work sites or homes throughout the surrounding areas of Elburn, DeKalb, St. Charles, Geneva, Aurora, Naperville, Elgin and Yorkville, Illinois. Our sod delivery fees vary depending on the amount of sod ordered and the distance traveled. If you would like us to deliver the sod to your work site or home, please contact us for pricing. A member of our team will be standing by to answer any questions you may have. We look forward to working with you soon. Dunteman Turf Farms offers sod delivery services to clients in Elburn, DeKalb, St. Charles, Geneva, Aurora, Naperville, Elgin and Yorkville, Illinois.